In an emotional moment, President Barack Obama embraced and shook hands with Hiroshima survivors on May 27 during his historic visit to the Japanese city. Obama is the first sitting president to visit Hiroshima after the atomic bombing on Aug. 6, 1945. “Death fell from the sky and the world was changed,” Obama said, after laying a wreath, and briefly closing his eyes and bowing his head to honor the victims at the Hiroshima Peace Memorial Park. “A flash of light and a wall of fire destroyed a city and demonstrated that mankind possessed the means to destroy itself,” said Obama during his speech. US President Barack Obama (R) walks with Japanese Prime Minister Shinzo Abe after laying wreaths in front of a cenotaph to offer a prayer for victims of the atomic bombing in 1945, at Hiroshima Peace Memorial Park in Hiroshima on May 27, 2016. President Obama, alongside Japanese Prime Minister Shinzo Abe in front of the iconic bombed-out domed building, urged the world to do better. After his remarks, the president met two survivors, 91-year-old Sunao Tsuboi and Shigeaki Mori, 79. The president and Tsuboi were seen smiling and exchanging a few laughs. US President Barack Obama (L) speaks with 91-year-old Sunao Tsuboi (2nd R), a survivor of the 1945 atomic bombing of Hiroshima, as Japanese Prime Minister Shinzo Abe (2nd L) listens during a visit to the Hiroshima Peace Memorial Park on May 27, 2016. 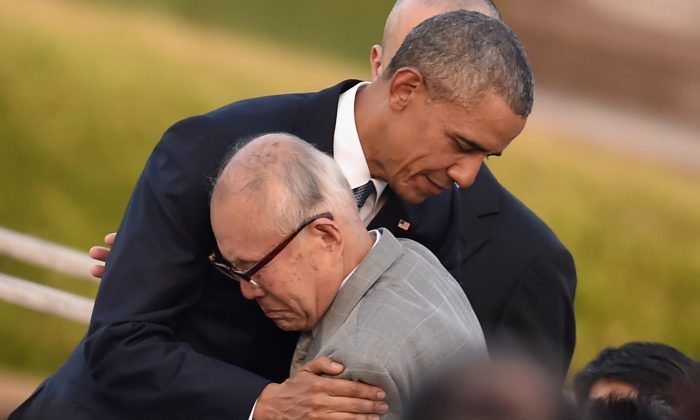 Obama then went on to give an emotional hug to Mori, a survivor who worked to gain official recognition of 12 Americans killed in the atomic bombing. After meeting the president, Tsuboi said he was surprised by how Obama held his hand and listened intently. “I held his hand, and we didn’t need an interpreter,” Tsuboi said after meeting with Obama, according to the New York Times. “I could understand what he wanted to say by his expression,” he added. Japanese President Abe said Obama’s visit, during which he did not apologize to Japan on behalf of the United States, was visit courageous and long-awaited. Abe also said it would help the suffering of survivors, and that he concurred with Obama’s anti-nuclear sentiments. Obama also went to the lobby of the peace museum to sign the guest book: “We have known the agony of war. Let us now find the courage, together, to spread peace, and pursue a world without nuclear weapons,” the president said, according to the White House.